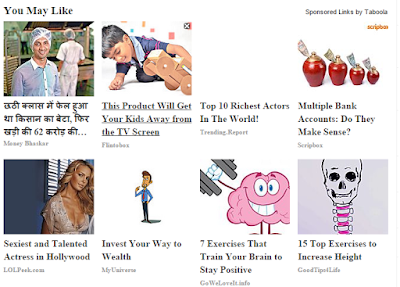 I have been invited to become a publisher on Taboola Ad Network few weeks back and I thought I would give it a try because I see Taboola Ads on popular news websites like Hindustan Times, India.com, IBTimes and few other popular news websites. Initially I had a negative impression on these type of ads as the ads look a little out of stream. But as the popular websites are using them I thought I would give it a try firstly and based upon the performance of the ads I would take a decision to continue it or stop it. Taboola is a contextual ad network similar to Outbrain, nRelate etc. I feel that the best contextual ad network as of now is Outbrain which will soon be replaced by Taboola for sure as they are expanding very fast. From my experience Outbrain is invite based and you have to wait for an invitation from them in order to participate in their publisher program. Taboola is also a kind of invite basis but you can contact them and tell them your stats of your blog to get started with their ad program. If you have a blog with decent traffic then the chances of you getting approval from Taboola is high. These ads appear along the sidebar and below the post without disturbing other ads on your blog/website. Generally the ads right below the post performs best. These ads just look similar to related posts on your blog and the reader tends to click on the ads which interest them. Thereby generating a very high ctr. I have joined the network and tested them for about a week and I was impressed with the revenue that I was generating from that. On an average the ecpm was around $0.5 to $0.7 which is very good for Indian Traffic. Initially I tested on couple of my sites allindiaroundup.com and ap2tg.com which receive a decent traffic. You need atleast 20,000+ visitors a day to make a decent revenue from this ad network. If you are having low traffic then this is not for you. As you can see from the below screenshot the CTR is somewhere between 1-3%. I have placed it below the social sharing buttons but if you place right below the article you can expect a CTR of 2-3%. CPC varies from 0.022 to 0.04 which is a decent CPC for Indian Traffic. If you are having traffic from US, UK, Canada I guess the CPC would be even higher. Place the ads right below the article to get high CTR. You would be having a dedicated manager if you get approval for a Taboola account as publisher. Be in touch with your account manager and ask them what can be done to improve the performance. Their support is great and responds within few hours. Place the ads away from Google Adsense as we tend to get good CPC’s on Google Adsense. So make sure this revenue is not effecting Adsense Revenue. Try this network only if you are having a decent traffic of atleast 20,000 visitors a day or else you won’t get much benefit from this network. To boost your revenue also get started using the right side bar widget of Taboola.